Only a day after an Ankara man was reportedly abducted, a philosophy teacher went missing on Apr 1, according to his wife. The 41-year-old lecturer, Onder Asan mysteriously disappeared on Apr 1, his wife Fatma Asan cried out on Twitter as she said she has not heard from Onder for 8 days. “I am wretched with my three kids,” Fatma said on a newly established Twitter account, asking for help from politicians and journalists. The Onder’s disappearance, if true, is the second of similar incidents in a week as Turgut Çapan, a former employee of Turgut Özal University, which was shut down by the government, was reportedly abducted in Ankara on Mar 31. Turgut’s wife Ulku said on Twitter that a friend of her husband dropped by her home on April 1 to say that Turgut had been abducted. While the reason for the alleged abduction of Turgut is yet to be known, earlier tips submitted to Turkey Purge as well as a number of other media articles reported on several mysterious incidents of abduction involving followers of the Gulen movement or others from groups critical of the Turkish government. 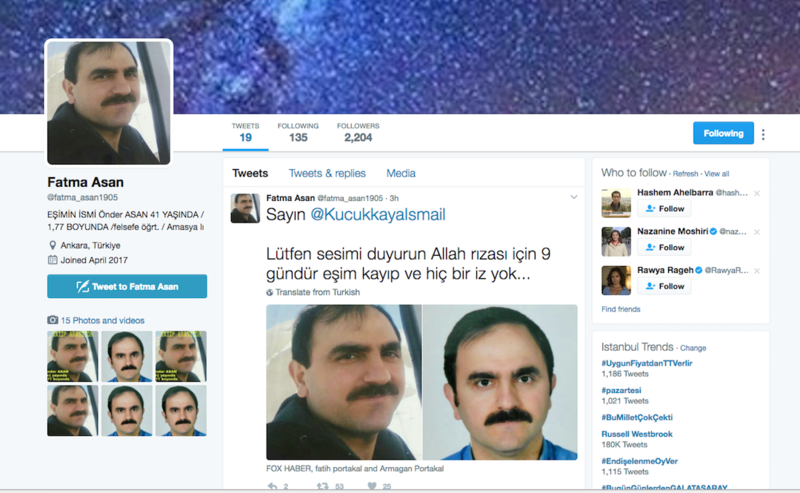 According to Aktifhaber online news portal, Onder used to work as a philosophy teacher at a secondary school closed by the government. Fatma later claimed that Turgut had been seen at the same apartment a day before her husband Önder visited it. The government pinned the blame for the July 15 coup attempt on the Gulen movement and has arrested 47,000 people over links to the group. Meanwhile, hundreds of schools and dormitories were shuttered over same charges; among them is Turgut Ozal University. Meanwhile, Fatma did not mention if her husband is related to the movement or not. Two Turkish men, one a teacher and the other a businessman, were abducted by Turkish intelligence officers in Malaysia, according to a tip provided by family members to Turkey Purge in mid-October of last year. Meanwhile, left-wing Turkish newspaper Evrensel reported on Jan. 10 that Zeynep Tunçel, a reader and distributor, was abducted and beaten by a group of unidentified people who accused her of resisting the government.